Class 10P have been using music to help them with their continued phonics learning. We are keen for the students to know the names of the notes that we use, and also to be able to give different names to the sounds that we hear whilst playing these notes. A series of letter cards were introduced by Miss G to help with this musical phonics learning. These fell into the A-G range in the alphabet. The challenge for the Class 10P pupils was to make a short word using these letters. Examples included CAB, BAG or CAGE. 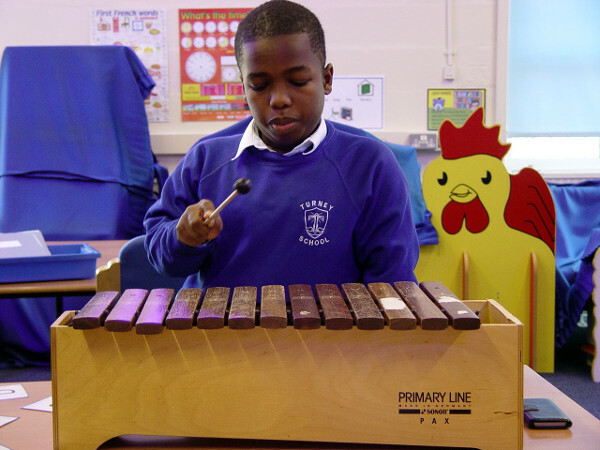 The pupils were then able to choose if they want to play the xylophone or the musical tubes. We asked each class member to play the word using their instrument. We asked them to explain to their friends what the word is, and to sound out the phonics that they can hear. This is all part of our overall musical learning in Class 10P exploring some of the sounds and instruments used in an orchestra. We finished off this session by watching and listening to a recording of Ravel’s Bolero for the 2014 Proms season. The pupils added the drum rhythm as we watched the clip.